Portland has a great lineup of AM and FM radio stations that broadcast something for everyone any time of the day and night. 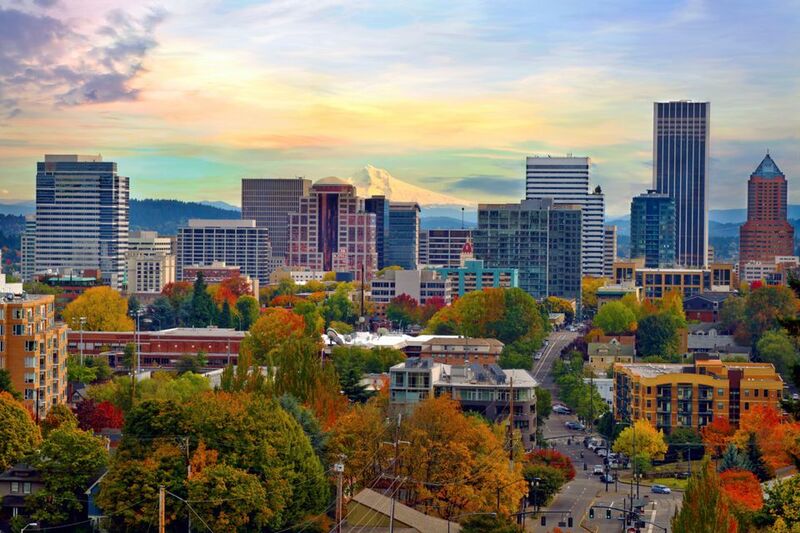 Whether your thing is news, music, sports, religion, or talk, you'll find a station on the dial to suit you when you're in Portland. 88.3 FM KBVM Catholic. Programming includes sacred music, catechesis, news, talk shows, prayers, and daily Mass. Morning Drive hosts, Dina Marie, and David share interviews, music, news, and prayers during the morning commute on weekdays at 7 a.m.
88.7 FM KLVP Christian. K-Love nationally syndicated Christian radio station. Round-the-clock inspirational programming includes music, news, prayer, and daily Bible verses. Sponsored events include cruises with Christian music artists and K-Love personalities. 89.1 FM KMHD Jazz. Locally produced eclectic jazz station. Listen to Blues Before Sunrise from midnight to 7 a.m. hosted by DJ Steve Cushing. Each hour features a different decade of classic blues. Alan Thayer hosts Brazilian Beat Saturday mornings at 9 a.m. Jazz legend Marian McPartland's syndicated NPR broadcast showcases the world's top jazz artists with talk and music Tuesdays at 6 p.m.
89.9 FM KBPS Classical. Locally supported all-classical, round-the-clock programming. Edmund Stone presents the award-winning show, The Stone, that delves into the history of classical music and its relation to film scores. Saturday host Ed Goldberg leads a mix of classical favorites — opera, show tunes, great film themes, comic operettas, and American band music. 90.7 FM KBOO Community. Volunteer, non-commercial, listener-sponsored, local community radio. Locally rooted in diverse music, culture, news, and opinions. Volunteer DJs play an eclectic mix from African to Mariachi. Every Friday at 6 p.m., Bread and Roses offers feminist public affairs programming. 91.5 KOPB Public radio. Programming includes BBC programming and NPR favorites, All Things Considered, This American Life, and Science Friday. The locally produced State of Wonder presents a weekly radio magazine of arts and culture. 92.3 FM KGON Classic Rock. Local Portland DJs play the Rolling Stones, Aerosmith, U2, The Beatles and way more. Listeners enter contests to win tickets to local concerts and trips, like a recent summer vacation in Bend, Oregon. 93.9 FM KPDQ Christian. Weekday Ministry of the Month with topics like Family Life Today, daily contests, alerts for Christian music concerts in the Portland area. Station sponsors listener trips to the Holy Land. 94.7 FM KNRK Alternative Rock. Weekdays at 8 a.m., Greg hosts 8 at 8, playing eight songs around a single theme. Daria and Gustav spin five hours of eclectic music every weekday on Alternative Afternoons. Contests include listener-submitted Perfect Playlists and concert ticket giveaways. 97.1 FM KYCH Eclectic mix. "Charlie's" motto is "we play everything." Listen to everyone from Cindy Lauper to the Bee Gees to The Clash. Additional programming includes community information, concert ticket contests, and Charlie's Random News show. 98.7 FM KUPL Country. "The Bull" broadcasts country music 24/7. Catch Cassidy Quinn from midnight to 5 a.m. weekdays, when Tony, McKinzie, and Jake take over for five hours of morning fun. Enter to win Portland Pickles baseball tix. 99.5 FM KWJJ Country. "The Wolf" spins country 24/7 from Lady Antebellum to Tim McGraw. Morning duo, Mike, and Amy start the entertainment at 5:30 a.m. every weekday, and it's Rick "Bubba" Taylor from 7 p.m. to midnight. 100.3 FM KKRZ Top 40. Round-the-clock hits, entertainment news, and local weather and traffic updates. Enter contests for concert tickets with an iHeartRadio account. 101.9 FM KINK Hits. An eclectic mix of artists from Jack Johnson to Bruce Springsteen. DJ Shauna Steele takes it from midnight to morning; Corey and Mitch start the morning commute at 5:30 a.m. Listeners sign up to receive weekly emails about contests, concerts, and local events. 103.3 FM KKCW Variety. Top-ten artists include Adele, Ed Sheeran, and Rihanna. Take the morning music quiz with Bruce, John, and Janine from 5 to 9 a.m. Listeners can sign up for news and sports updates, and birthday presents. 104.1 FM KFIS Christian. "The Fish" spins Christian music and also sponsors local events like Fish Fridays at Oaks Park in summer. Kevin and Taylor do the morning show starting at 5 a.m. with favorites like Jamie Grace, Laura Story, and Francesca Battistelli. 105.1 FM KRSK Hits. "The Buzz" broadcasts current hits, sponsors contests for cash and concert tix, and supports community events. Cruise in the morning from 6 to 10 a.m. with DJ Cruze. 105.9 FM KGON Classic Rock. "The Brew" plays oldie favorites like AC/DC, Green Day and Queen, as well as local news and weather. Enter contests to win concert tix for Steve Miller, Foo Fighters, and more. 106.7 FM KLTH Classic Hits. "The Eagle" broadcasts local news, weather, traffic, and events along with an eclectic mix of artists from ABBA to John Lennon and The Doors. 107.5 FM KXJM Hip-Hop and Throwbacks. Kanye West, Missy Elliot, Jay-Z, and more. The station partners with Keep Oregon Well through the Wellness Zone with exclusive interviews and a place to encourage mental health. 620 AM KPOJ Sports. "Rip City" is all sports. Listen to Rip City Drive from 3 to 6 p.m. weekdays, Fox Sports Radio Weekends, and Portland Trail Blazers basketball games and news. 750 AM KXL Sports. "The Game" covers Seattle Mariners baseball and local sports. Talk show host Dino Costa is on air four hours every weekday afternoon with extemporaneous conversations and opinions about all things sports. 800 AM KPDQ Christian. "True Talk" Christian radio weekday lineup of shows includes Jay Sekulow Live, Bless Israel with Rabbi Yechiel Eckstein, and the Eric Metaxas Show. There are also on-air Bible classes. 860 AM KPAM News/Talk. Covers local news, weather, and traffic. Syndicated national news show This Morning With Gordon Deal airs from 3 to 6 a.m. Afternoon Northwest features local talk and interviews. 880 AM KWIP Hispanic. "La Campeona" features 24/7 Spanish-language broadcasting. Music and news. 1080 AM KFXX Talk. Local and national news, sports, weather, and traffic. Syndicated broadcasts by Rush Limbaugh, Glenn Beck, and more. 1190 AM KEX Talk. Sports coverage of Portland Trail Blazers and Oregon State Beavers. Chuck Price, the Financial Doctor, discusses personal finances, retirement, and investing Saturday mornings at 8. 1330 AM KKPZ Christian. Timothy Moore hosts the Impact Radio Show, a local, live call-in program weekdays from 4 to 5 p.m. Start the day at 4 a.m with Pastor Rick Warren's Daily Hope show. 1360 AM KUIK News/Sports. Broadcasts Major League baseball and OIBA games. The Westside Morning Report, hosted by Dave Bourne, features local news, traffic, weather, and interviews from 6 a.m. weekdays. 1410 AM KBNP Business. "The Money Station" broadcasts business and financial information, including CNN's Lou Dobbs Financial Report. Sylvia Gerke of the Portland office of U.S. Small Business Administration interviews local entrepreneurs daily.